Have you seen this beautiful Advent wreath popping up on different Catholic websites? Yeah, I did too. And since I was in the market for a different Advent wreath, I noticed it. I liked that you could use regular tealights instead of colored candles. I liked the idea of chimneys to protect little hands grabbing at pretty flames. I liked the multi-layered look and the open scroll work that I could decorate with greenery if I so chose. So when I saw one on the Advent table of our local Catholic bookstore for a reasonable price (and no shipping fees or damages to worry about) I bought one and brought it home. The one I purchased came with electric tealights which I replaced with real tealights. Aside from a few minor points, I was mostly pleased with it. 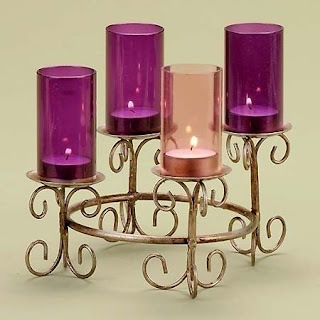 Do you see how those violet/rose glass covers go straight up....as opposed to tapering OUT a bit, like regular votive holders do???? Do you think they'd get black and stained easily??? Thus requiring a bit more scrubbing than I'd like, and eventual permanent staining? So I tested mine. And... Suzanne is right. After only one burning, there was noticeable soot on the top of the chimneys when wiped with a paper towel although it was not visible on the glass. But that was only one burn for about an hour which is about how long our candles stay lighted every night during Advent (give or take). Also, the chimneys got really hot. So hot that I couldn't lift them to blow the candles out and had to extinguish the flames from the top which produced more smoke that probably contributed significantly to the soot on the paper towel. So, while I am a little disappointed that I spent the money on something that isn't going to be usable, I have also been re-inspired to go back to our suspended wreath. I do plan on letting the kids use it with the electric tealights. The bookstore is owned by the local Catholic parish so the money was basically a donation anyway. Just felt like this needed to be said. And now, back to my regularly scheduled mommy blogging. Just felt like this needed to be said. I like that wreath for all the things you mentioned. Maybe I'll get one and use electric lights??? Beeswax candles don't smoke as much - maybe that would help? Electric candles will work no problem with this wreath! I thought about beeswax but there is still the whole burning hot glass chimney thing to worry about. I know that a candle has an open flame which can burn, but it's not like the whole candle gets burning hot. I might see if I can get some beeswax tealights though just to test them out. We use kerosene lamps occasionally and this is just a problem with glass lamps. They need to be cleaned regularly - remember those old stories where someone in the family had the weekly job of cleaning all the glass lamp covers? What if you removed the glass and used large colored candles instead? You'd be able to use it and feel like you haven't wasted (as much) money. I'm sure your ingenuity could figure out how to keep them in place. Just wanted to drop a note and thank you PROFUSELY for the beautiful Saint coloring pages you provide for feast days. My kids and I are trying to celebrate a High Tea each time a significant feast comes around and having those coloring pages really helps them connect to the Saint at their level. You are a gifted artist and a very generous woman. Thank you again! Lovely! Maybe that is why it came with electric lights. I think the smoke adds character. Where can you get that advent wreath at? I love the look and plan on using electric tealights.